This year's edition of the Challenge was closed for new submissions last Thursday (1.Dec), as planned. Fortunately it seems there weren't new leaks with further details before that. The prizes and and the 9392 Quad Bike building instructions are still to arrive, hence I've not yet started the mismatches counting. I guess I'll have all the evaluation work ready at sometime, during next January (also the usual timeframe from previous editions). In the meantime, let's see the submissions that we get from you. For several reasons and circumstances the model chosen for the Challenge this year, was a bit larger than in previous editions. The chain elements also represented a new challenge for many of the potential participants and they were not available from LDD, which may have caused the small decrease in participants when compared to the previous edition (10 vs 13). The difficulty to find some parts in LDD was again an evidence that the tool is not yet mature enough to use in this type of Challenge (if it will ever be... now the the LEGO Design by Me service will be shutdown). Other parts were only available from the LDD Extended Mode, but this was already something we were counting with. If nothing substantial changes in between, I think the next year we will take a step back and will not consider LDD again. Espen Danielsen (Nazgarot) - Submission not considered, because it arrived already after the contest have been closed. As a matter of curiosity, it is the first time we get participants from some of the countries above, like Denmark, Israel and Australia. Bellow you may see the renders provided by the participants, with their submissions. These figures include the participation that arrived after the deadline. They seem to confirm that LDraw/MLCad is still the preferred CAD tool among the Technic builders. In order of appearance from left to right: Nathanaël, Han (2), Lasse, Scott (2), Luc, Shimon, Jeremy, Philippe (3), John, Ismaël, and Espen. All the renders submitted look somehow different from each other, and as usual I'd like to highlight one the caught my eye, independent of the Challenge classification it will get in the end. Maybe it was because of the shaded elements with solid edges and the shadows on the floor. Interestingly several of the participants decided to share and discuss their options, regarding the guess work they had to do while modeling 9392. You may follow and enter the discussion if you haven't done so far, at EuroBricks. Let me post here just a few images from that guess work and details being discussed. 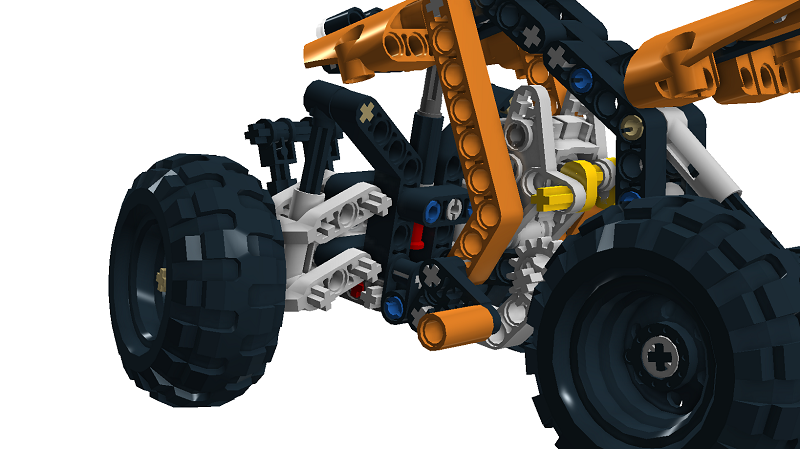 Let me express here how thankful we're for those who took their time to participate, and for the LEGO Technic Design Team for having accepted to collaborate with TBs oncemore with this Challenge and for supporting us with all the prizes to give away. Added the distribution of used tools by the participants, which I forgot to include in first place. LDraw still takes the lead! I'd like to thank you for running this contest again this year. As always, it was a lot of fun to try to figure out all the parts that couldn't be seen. The instructions are online! Now I can finally check my model. I think I just build it in LDD and than compare between the 2. Should I post the official model? It would make judging easier.